Podcast spotlight on How Stuff Works, y'all... *dah dah*... oh yeah, oh oh yeah! How do you get it? : Listed in iTunes by searching "Stuff You Missed in History Class"
Do they spoiler the books they discuss? : Mostly nonfiction books are mentioned, so not sure how you calculate spoilers on that... Spoiler! Lincoln gets shot! Should I listen to every episode? : If you are a geek or a history lover or both, you'll probably enjoy any of the episodes. If you're not a history lover, this is pretty topic specific, in terms of what will interest you. That being said, they make topics I was lukewarm on interesting. The Turtle Ships? Otzi? Who knew? What's awesome about this podcast? : This is the epitome of geeky fun. It's the kind of podcast that will make you insufferable to your friends, because you will constantly be poking them to say, "Did you know? Did you know?!" 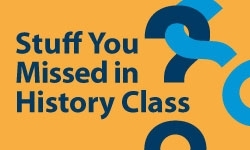 I should start doing this on Twitter so that my friends can get a break... anyways, this podcast basically does exactly what it says: it covers stuff that you missed in history class. They'll take a less well known event and spend 15-30 minutes discussing what happened, why it happened, and what the implications of it happening are. This might sound not so interesting, but I find myself listening to a couple hours of this almost every day at work. Since they have such a huge backlog, you can have new episodes to enjoy for weeks. I also appreciate that they cover a very wide range of periods, cultures, and types of history. One day it will be a story from medieval Chinese military history, and the next day it will be about the cult of beauty in the 19th century Austrian royal court. They just got through doing H.H. Holmes' murder castle, which was fascinating and got me pumped to read The Devil in the White City (thankfully it's a part of the 2012 Challenges plan!). Basically, it doesn't matter what the topic is - they find a way to keep your interest and teach you something at the same time. Plus, they have a thing for exhumations, so you get to find out just how many famous dead people get dug up. I also love that by listening to so many of them, I've started to get a much better sense of the timeline of history - I see much more clearly how the history of country A relates to what's happening in country B. This has enriched my nonfiction and fiction reading alike. And I've gotten so many ideas from stories from this podcast for my own writing. Bottom line is that I really enjoy this podcast and would recommend it to just about anyone, but especially for parents who want to foster a love of history in their kids and adults who have never lost their love of learning. What's not so awesome about this podcast? : Like I mentioned, the earlier ones just aren't as good as later ones. Some of it's the hosts, but it's more about the format. They hadn't quite found the special sauce of finding semi-obscure events or a different angle of well-known events and taking a deep dive. Rather, they have a brief overview of the surface details that you didn't miss in history class. It's just not as interesting - may be a good refresher for those who are studying the topic in a class or for those who happened to miss something like the Salem Witch Trials, but most folks aren't going to get too much new info from them. As I said, start around July 2009, which is when they hit their stride.